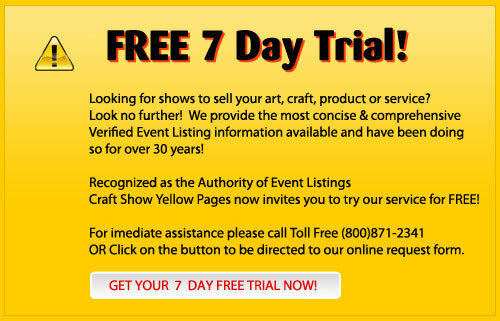 Are you looking for a detailed listing of Art & Craft Shows, Fairs & Festivals in Connecticut? Are you looking for detailed listings of Art & Craft Shows, Fairs & Festivals? WE do the research so you don't have to! Nobody does it better. Treat yourself to a subscription instead of spending your time hunting for shows! Get hundreds of thousands MORE events than you see on our sample website! 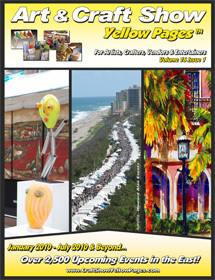 We publish Art & Craft Show Yellow Pages Online, the craft show guide for New England and Mid-Atlantic states. Subscribe now for Instant online Access. Email updates between hard-copy issues mean that you get updated information ELEVEN TIMES A YEAR, four publications and monthly email updates! Won't that feel good? Milford, CT: 23rd Annual New England Arts & Crafts Festival on the Downtown Green, Broad St. Outdoors, 10:00-5:00, free Adm., 200 spaces, arts, crafts, food court, music, live theater at the Center for the Arts adjacent to the Green. Juried by digital images on CD, 1 of display, security, food vendors - call. Security. $120 - $180, 15,000 last yr, 23 yrs, application online. Milford, CT: Walnut Beach Arts & Crafts Festival at Walnut Beach: Outdoors, 9:00-5:00, free Adm, 100 spaces, screened arts, crafts, live music, demos, antique car show, - more! 12'x12', $50, 11 yrs, 2,000 last yr, application online. Fairfield, CT: Kiwanis Arts & Crafts Fair on the Town Green, 10:00-5:00, free admission. Outdoors, 79 spaces, arts, crafts, juried by 3 photos/digital images on CD. Annual History Museum Party/Picnic, food. No food vendors. 10x10', $175 spaces, 18 yrs. Newtown, CT: NUMC Fall Arts & Crafts Fair at the Reed Int. Sch, 3 Trades Lane. Indoors: free Adm., 10-4, 35 spaces, fine art, crafts, juried by 4 photos, 1 of display. $90, 10x10', Elec $25, +$10 Crnr, 1200 last yr, 19 yrs, Application online: Click here! Guilford, CT: 27th Guilford Civic Women Harvest Festival on Guilford Town Green, end of Rte 77, 10:00-4:00. Outdoors, unlimited number of spaces, free Adm., arts, crafts, juried by photos. Food vendors invited; live music, children's crafts, apple crisp, lunch, fun. 12'x12', $60. Stratford, CT: Autumn Fest at 2600 Main St., Indoors: 10:00-4:00, free Adm., 50 spaces, arts, crafts, new Mdse, collectibles, food, Ltd. electric. Tables available by pre-arrangement, n/c. 10'x8' spaces, $30, 5th yr, 500+ last yr.